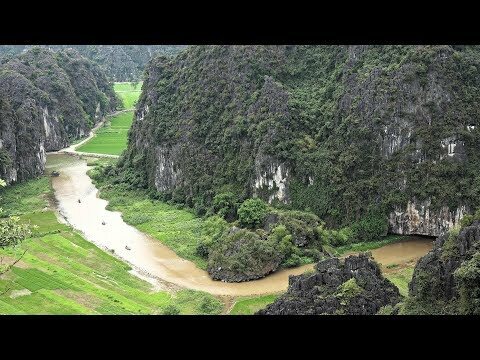 The area around the city of Ninh Binh in Vietnam is famous for its Karst scenery: rivers flowing between karst peaks, through caves and rice fields. Trang An Landscape Complex is an UNESCO World Heritage Site, boat ride takes the visitors through 9 caves/tunnels. The Hang Mua peak offers views over the nearby karst peaks, rice fields and rivers. In Tam Coc another boat ride takes the visitors through 3 caves/tunnels and between rice fields. Van Long Nature Reserve has more peaks and caves and beautiful reflections in its calm waters.